Extravagance is a recurring theme in Japanese culture. But it isn’t merely limited to choice tuna cuts, and gourmet fish roe. In Japan, food presentation is considered both an ancient art-form, and means of expression, once used to convey one’s wealth and status. 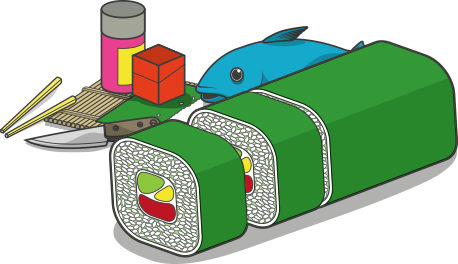 And while today’s attitudes are a little more relaxed, hosts are still expected to make a vested effort for special occasions – hence why themed sushi is becoming increasingly popular! Boats aren’t the first thing that spring to mind when looking for theme inspiration. 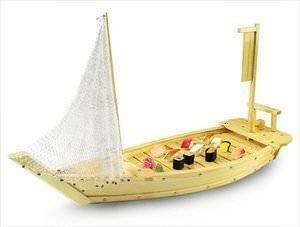 However, they have particular significance in Japanese culture, since most sushi ingredients are ‘of the sea.’ Handmade from natural bamboo, our Wooden Sushi Boat Serving Tray is almost an exact replica of a traditional Japanese fishing boat – right down to the slatted to decking, wooden masts, and intricately woven nets. Each boat is hand-finished in a food-safe wood lacquer to enhance the natural color of the bamboo, and also create a protective barrier against moisture, grease and food. Looking for a conversation piece? Measuring an impressive 67.3 cm (26.5”) in length, our Wooden Sushi Boat Serving Tray was designed to garner attention. However, it’s not just esthetics that make this fishing boat a show-stopper. Look closely and you’ll notice the decking is a removable component; a design feature incepted to make both setting up sushi, and cleaning, as straightforward as possible. Ready to (quite literally) push the boat out for your guests?